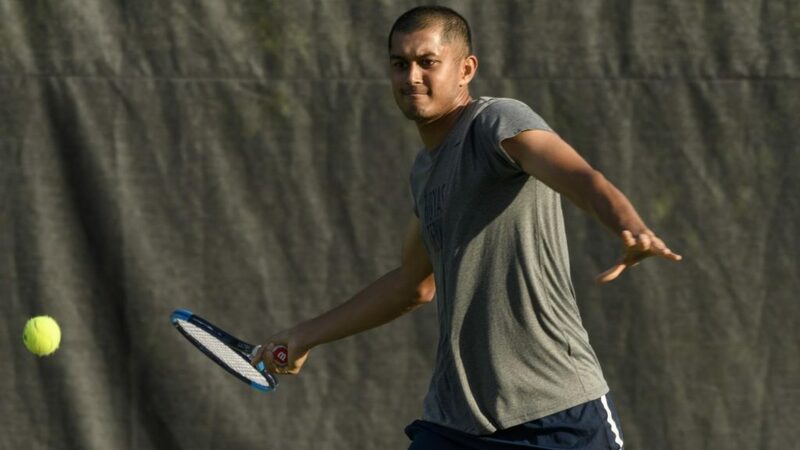 This weekend, the Georgetown Hoyas men’s tennis team (2-3, 1-2 Big East) picked up their first two victories of the spring season. The wins at the Junior Tennis Champions Center in College Park, Maryland snapped a three-match losing streak to open the season. 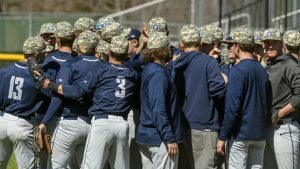 On Friday, the Hoyas defeated crosstown rival George Washington (1-1, 1-0 Colonial), 4-3. Though sophomore Rohan Kamdar was bested in the No. 1 singles match, sophomore Connor Lee defeated his opponent, freshman Ryan Navarro, and Georgetown senior Michael Chen defeated freshman Ben Barnett, both in two sets. In doubles, the teams of Kamdar and Lee, and Chen and senior Will Sharton, each won their matches, giving the Hoyas the doubles point. However, the Hoyas lost both the No. 4 and 6 singles, and the teams were tied 3-3 going into the final singles match. Sophomore Luke Ross triumphed in the No. 5 singles match over GW freshman Hanyu Liu to clinch the victory for the Hoyas. Ross won the first set 6-4 and took the second set in a tight 7-6 contest to send the Hoyas home victorious for the first time on the year. The Hoyas now have now won two consecutive matchups against the Colonials. 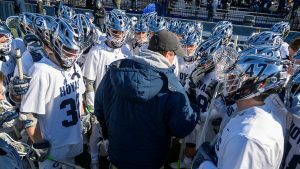 On Sunday, the Hoyas continued their winning ways with another 4-3 victory over Xavier (1-5, 0-2 Big East), extending the Musketeers’ losing streak to four. 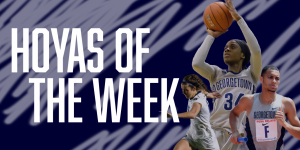 Despite the close final score, Georgetown was able to put this match away early, as the Hoyas had already clinched the match at 4-1 before Xavier could mount a comeback. Kamdar won the No. 1 singles match this time to win the Hoyas’ fourth and deciding point, losing the first set but taking the next two. Though Lee and Chen fell against their opponents, freshman Andrew Rozanov defeated senior Connor Lafavre, and Ross again won his match, despite losing the first set. Georgetown took the doubles competition, as the teams of Kamdar and Lee, and Rozanov and Sharton both won. Georgetown will hit the courts next on Thursday, Valentine’s Day, when they take on Longwood (2-1, Big South) at Yates. The match is set to begin at at 3:00 p.m. ET. For continuing coverage of all Georgetown sports, follow @GUVoiceSports on Twitter.